When paraffin sections are mounted on slides and viewed down a microscope, they appear colourless and offer little in the way of information. In order to improve contrast, staining the sections with dyes imparts colour to both cells and tissues. However, the principal staining technique (and the gold standard) used in histological diagnosis is the haematoxylin and eosin (H&E) stain. This is a natural product that is extracted from the heartwood of the logwood tree Haematoxylon campechianum which is native to Central America and the West Indies. Haematoxylin is relatively colourless and without modifications has little value as a biological stain. 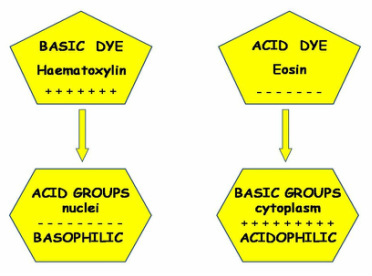 To produce a functional dye, haematoxylin must be oxidized to haematein either naturally by exposure to light or instantly with chemical oxidisers such as sodium iodate (see images below). This haematein is then subsequently bound to one of several metal ions such as aluminium in the form of ammonium alum (ammonium aluminium sulphate), potassium alum (potassium aluminium sulphate) or sodium alum (sodium aluminium sulphate). 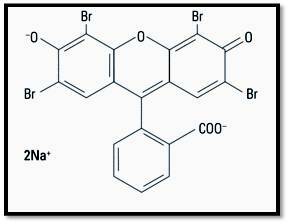 These solutions are generally termed haemalums or alum haematoxylins. A metallic ion bound to a dye that is involved in the binding of the dye to tissue is termed a mordant and the resultant complex termed a lake. Haematoxylins with high aluminium to haematein ratios will stain sections slowly until selective colouration of nuclear chromatin is achieved. This is called progressive staining. Conversely, solutions with lower chemical ratios will over stain all tissue components more rapidly. As a result, the desired nuclear staining intensity is selected by differentiating the sections in a dilute acid-alcohol mixture, thereby removing excess metal-dye complexes from the sections. This selective method is termed regressive staining. In tissues stained by haemalum, cell nuclei are usually a reddish brown colour (see image below left). This colour is changed to blue by rinsing in tap water (if its pH is above 5) or a tap water substitute such as that of Scott which contains sodium bicarbonate and magnesium sulphate (see image below right). The process shown below of converting the initially red soluble aluminium-haemalum ions to a final blue insoluble form is termed ‘blueing’. Other than aluminium, there are several other metal ions that may be used with haematoxylin. This is the metal most often used in industrial dyeing because it can form stable complexes or chelates with dyes. Chrome haematoxylin complexes are able to bind to nuclei at low pH but will also stain components such as lipoproteins, phospholipids, myelin and cells of the pituitary and pancreas. Haematoxylin solutions containing copper are able to stain fatty acids, myelin sheaths and mitochondria as well as the acidophil cells of the pituitary. Haematoxylins containing iron normally incorporate it in the form of ferric chloride or iron alum (ferric ammonium sulphate) although ferrous salts can also be used. These solutions are relatively unstable and the effective staining life of them is very short once they are combined. Iron haematoxylin methods such as those of Weigert and Heidenhain demonstrate nuclei and many other structures such as muscle striations, mitochondria, myelin, keratin and elastic fibres. The celestin blue - haemalum method is often used as a nuclear stain as a substitute for iron haematoxylin, particularly in trichrome procedures (which uses acidic counterstains) since differentiation is not required. Sections are first treated with a solution containing celestin blue and iron alum before being treated with an alum haematoxylin. This combines with the first solution to produce a celestin blue-iron alum-haemalum complex that is highly stable in the presence of acid. The lead haematoxylin method has an affinity for nerve fibres although this solution will also demonstrate nuclei, nucleoli, calcium, smooth and striated muscle and neuroendocrine cells. The use of molybdenum was originally used for nerve tissue but it is now principally used to stain collagen. However, with increased concentration and the addition of dioxane, the solution will demonstrate reticulin, basement membranes and muscle striations. This is usually incorporated as phosphotungstic acid as seen in Mallory’s phosphotungstic acid haematoxylin (PTAH) method. Solutions of haematoxylin mordanted with tungsten are unique in that the single solution gives two staining colours of reddish brown and blue. This is a progressive stain and therefore does not require differentiation. The components that stain reddish brown include connective tissues such as reticulin, collagen, elastic fibres and cartilage. Nuclei, fibrin, muscle striations and nerve fibres stain blue. Often simply called the H&E, the haematoxylin and eosin stain has been regarded as the gold standard in histological diagnosis for more than 100 years. The staining revolves around the use of haematein, an oxidation product of haematoxylin (a basic dye) and its combination with aluminium ions. This forms the solution haemalum which essentially stains cell nuclei blue. This is followed by the application of a solution of the red dye eosin (an acidic dye) which colours other structures such as cell cytoplasm and connective tissues in various shades of red. The mechanism put forward for attaching haemalum to cell nuclei is one involving coordinate (covalent) bonds between phosphate oxygens of DNA and aluminum atoms, and between aluminum atoms and haemalum molecules. The phosphate groups of DNA are more strongly acidic than the carboxyl groups of proteins in cytoplasm and connective tissue. Traditionally, it was assumed that the aluminium atoms (which combined with the oxygen atoms of haematein) were attracted to the phosphate groups of the nuclear DNA to form a complex (see image below). Consequently, this trapped the aluminium ions between the DNA and the dye. 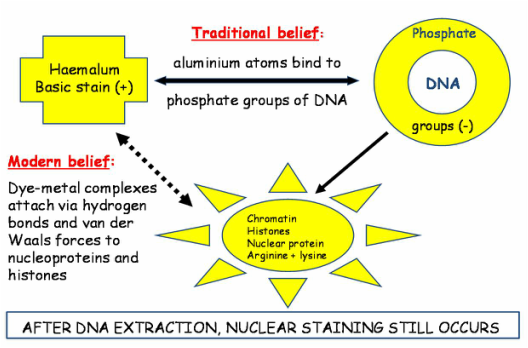 However, nuclear staining has been found to be only slightly weakened following extraction of DNA. This suggests that the attachment of haemalum and dye-metal complexes to chromatin does not require the presence of DNA. Modern interpretations suggest that the dye-metal complexes actually attach themselves directly to the histones and nucleoproteins, particularly those rich in the amino acids arginine and lysine. The dye most often used as a counterstain to haemalum is eosin Y. This is a red fluorescent dye resulting from the action of bromine on fluorescein (see structure below) and it stains cytoplasm a pink-orange colour. Cytoplasm is composed of proteins that are formed by peptide chains of amino acids (see image below). One end of the protein is an amino (NH2+) group and the other a carboxyl (COOH-) group. The average pH of amino acid is about 6.0. If the pH of the amino acids is lower, they gain hydrogen ions and become positively charged. Conversely, if the pH is higher, then they lose hydrogen ions and have a net negative charge (see image below). In order to stain, eosin needs to maintain a positive charge on the proteins (< pH 6.0). If eosin has a pH greater than 6.0, the cytoplasmic proteins become negative and eosin will not stain. If eosin has a pH lower than 4.0, the negatively charged eosin will bind the free hydrogen ions and become uncharged. As a result, the eosin will stain non-specifically. Ideally, the pH of eosin solution should be 4.5-5.0. Eosin is often used as a slightly acidic, aqueous solution. The addition of acetic acid to aqueous eosin lowers the pH thereby neutralizing the COOH- groups of the proteins. This results in more positive charges on the NH2 + groups to which the negatively charged eosin is attracted. Alternatively, eosin can be used as an alcoholic solution which can improves the eosin uptake. Following staining with haemalum, counterstaining sections with eosin changes the colour of the nuclei from blue to purple (see image below). This is probably the result of combined attraction of eosin to the positively charged amino acid side chains of nucleoproteins and to the aluminium-haemalum complex that is bound to the chromatin. In the routine histology laboratory, H&E staining and coverslipping is generally performed using an automated staining machine and coverslipper which may be separate or integrated with the stainer. 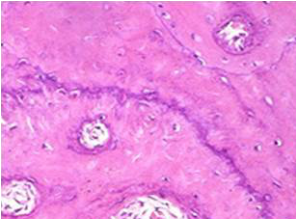 The most common diagnostic tool in histology is the haematoxylin and eosin stained tissue section. However, techniques termed ‘special stains’ are often required on tissue sections to further evaluate a disease process or help confirm a diagnosis. These techniques employ a wide variety of dyes, each having the ability to demonstrate certain tissues, cellular structures or pathogens (such as fungi and bacteria). There are numerous such stains that help in evaluating tissue sections and many of these can be viewed in the A-Z gallery of special stains below. For those of you who would like more information on classifications, theory and principles of staining in topics such as carbohydrates, infective agents, lipids and pigments, you can download the appropriate file below.